Mortgage fees, also known as closing costs, equal approximately 2% to 5% of the home's purchase price. Mortgage fees, sometimes known as closing costs, are the various fees and charges which are incurred once a buyer signs all the papers and closes on a home. The amount of the mortgage fees depends on the value of the home being purchased; typically they are somewhere between 2% and 5% of the cost of the home, and are assessed in addition to any down payment made. In the United States, mortgage fees or closing costs, total around $110 billion US Dollars (USD) per year and include the costs of such things as the title search and insurance, home appraisal fees, mortgage insurance and a credit report request. The fees generally fall into three different categories: origination, escrow and final costs, although most mortgage lenders simply lump them all together. By law, a lender must give a buyer some kind of estimate of what the total mortgage fees might be; this is sometimes known as a good faith estimate. This estimate should be included with the details of a home loan, and while these fees can’t be entirely avoided, it is possible to eliminate or reduce some of them. Not all the fees will apply for a mortgage loan that is being refinanced. 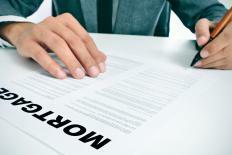 A lender may even pay some or all of the mortgage fees in an effort to attract business. Whereas the exact breakdown of mortgage fees will vary, there are certain things which are usually included. A mortgage broker or lender will assess an application fee; typically this is between $75 and $300 USD. A buyer generally has to pay for a land survey, typically costing between $150 and $400 USD, as well as an appraisal of the home, which usually costs from $300 to $700 USD. A loan origination fee is paid, which is usually at least 1% of the total loan amount. Other mortgage fees include a credit report fee, a mortgage insurance premium and homeowner’s insurance. A buyer may have to pay city property taxes, recording fees to indicate the sale of the home on public record, as well as perhaps fees for an inspection for lead based paint and a pest inspection. There are also various miscellaneous fees a buyer will be responsible for, usually ranging from $200 to $1,000 USD, depending on the complexity of the mortgage. These fees include the costs for signing and delivering any documents associated with the mortgage, as well as any attorney’s fees and notary’s fees. It’s important to make sure these charges aren’t being paid twice as they can appear under different names. Many home buyers understandably can’t keep up with all these mortgage fees. If in doubt, a buyer should ask for a detailed breakdown and always query anything that isn’t clear. How do I Choose the Best Land Mortgage? What is Mortgage Credit Insurance? What is a Mortgage Application Fee? What is a Prepayment Fee? What is a No Fee Mortgage?